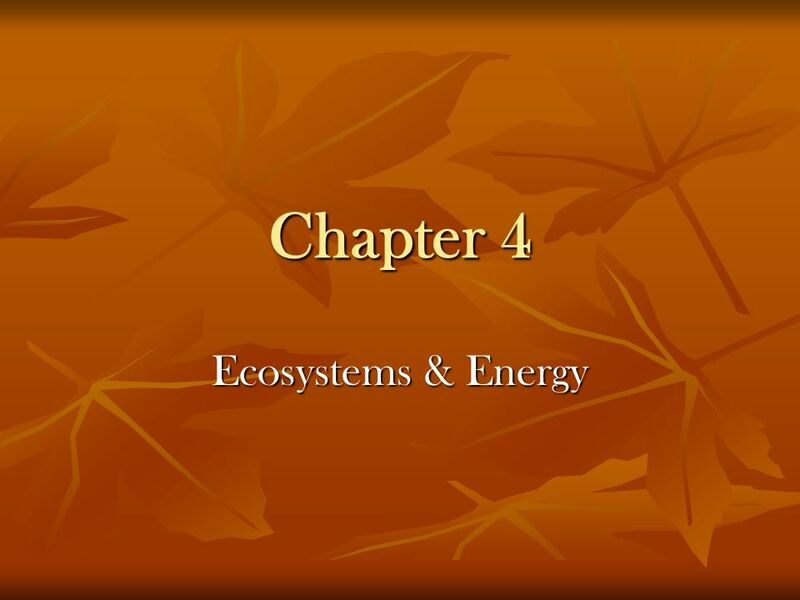 Chapter 4 Ecosystems & Energy. 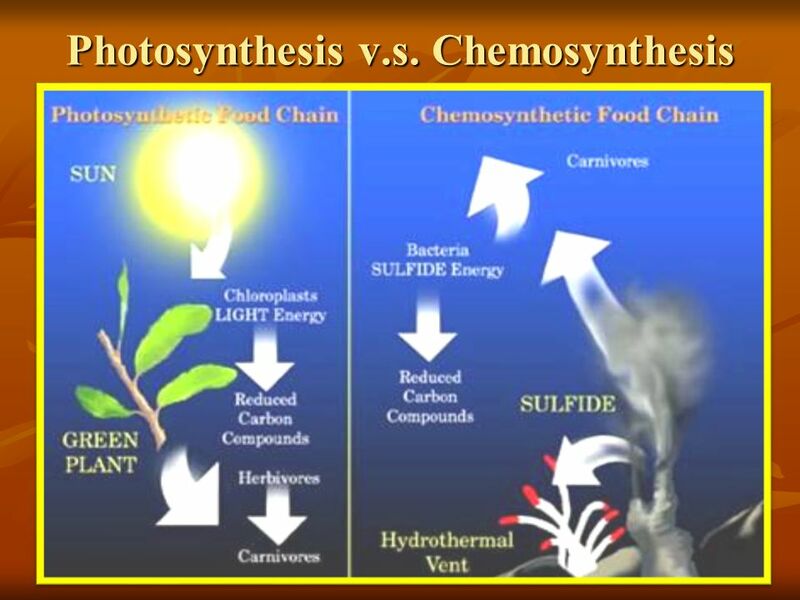 Ecosystems & Energy Introduction p Photosynthesis & Respiration p.69 Life Without the Sun, p.69-70 How Humans Have Affected the Antarctic Food Web, p.74-75 Envirobriefs p74, 75 hint..hint..
9 Energy Usually expressed as units of work (kJ) or units of heat energy (kcal) 1kcal = kJ Can exist as potential energy or kinetic energy Energy can change forms! 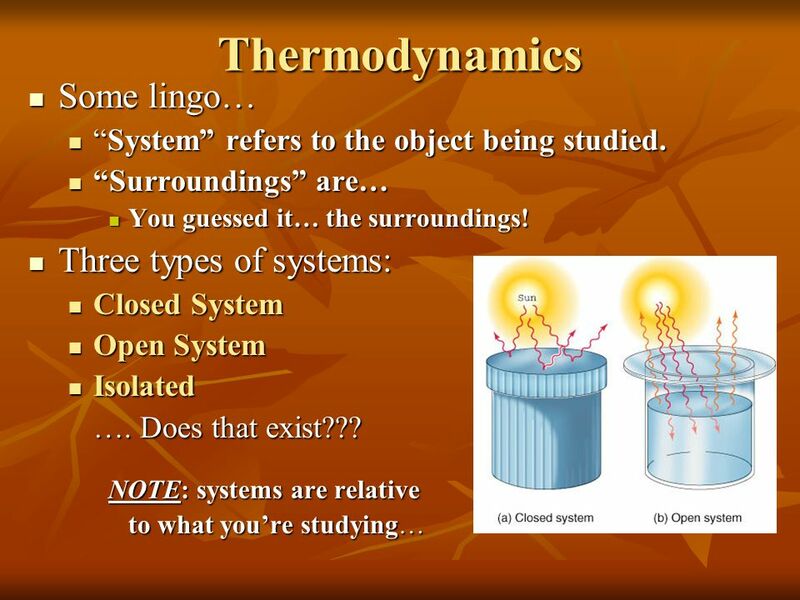 Study of energy & its transformations = THERMODYNAMICS! Energy cannot be created or destroyed, but it can be transformed. 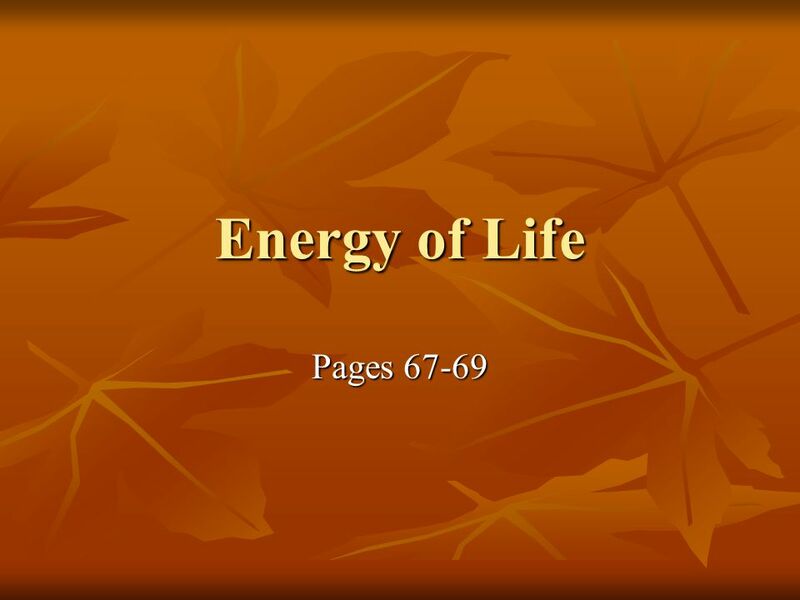 The energy of a system and its surroundings is always constant… Energy can flow in/out of the system, but overall, the entire system’s energy remains the same. How is it transformed? 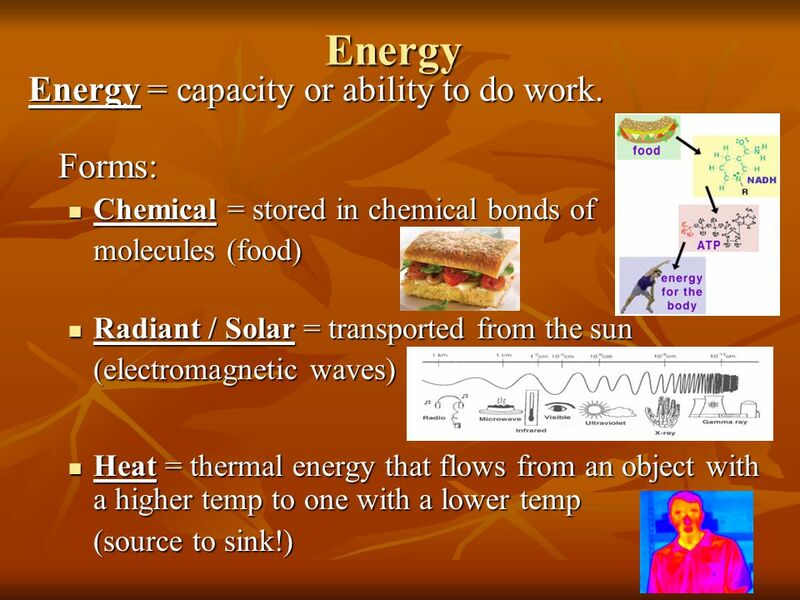 Ex: Chemical energy (stored in food) is transformed into mechanical energy (for us to move). 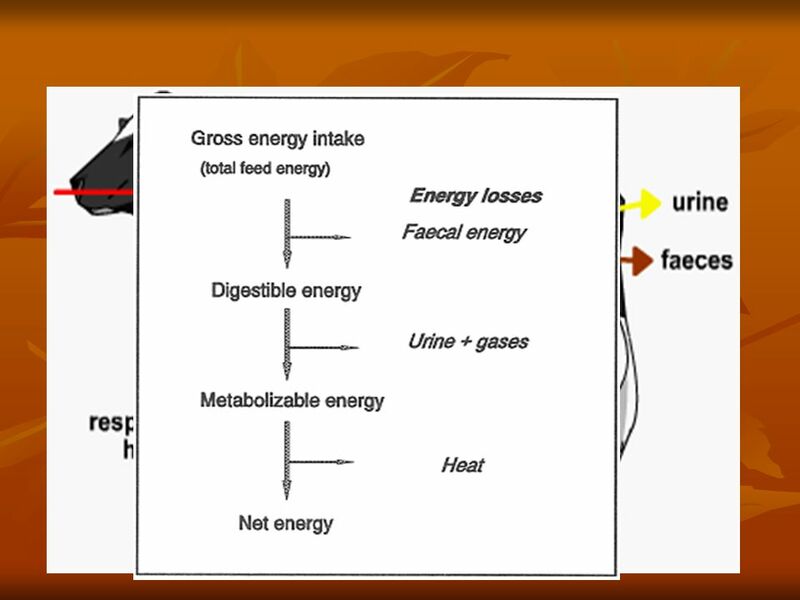 When energy is transformed, some usable energy is lost to the environment as heat. Less-usable energy is more diffuse/disorganized. Entropy = measure of disorder or randomness. 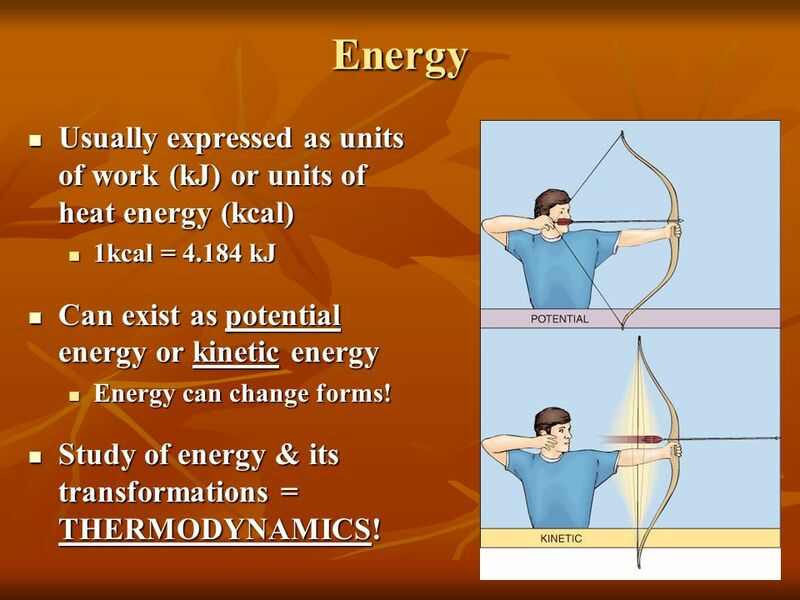 Organized, usable energy = _____ entropy Disorganized, unusable energy = _____ entropy (heat) Entropy is always increasing over time  NO process requiring energy transformation is ever 100% efficient. Much of it is dispersed as heat. 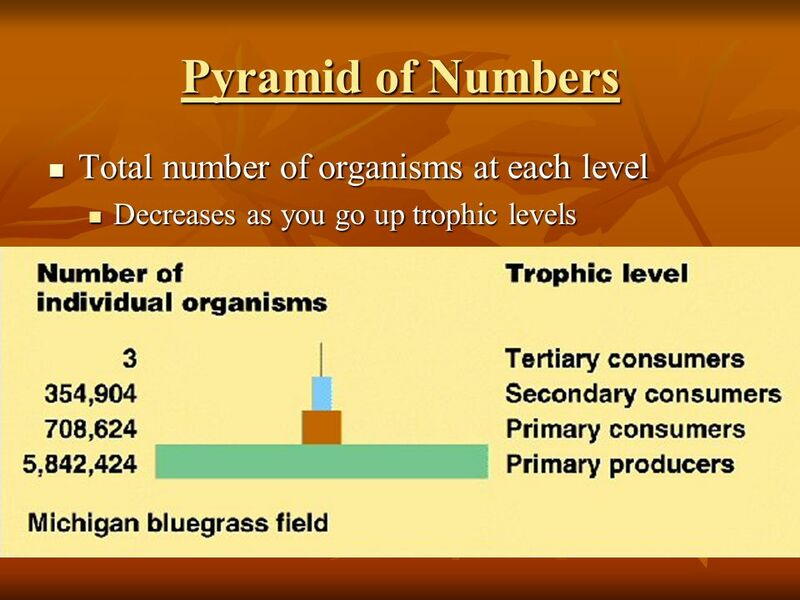 Ex: automobile engine is 20-30% efficient Organisms are highly organized and as they grow they remain organized. Why doesn’t this refute the 2nd law? 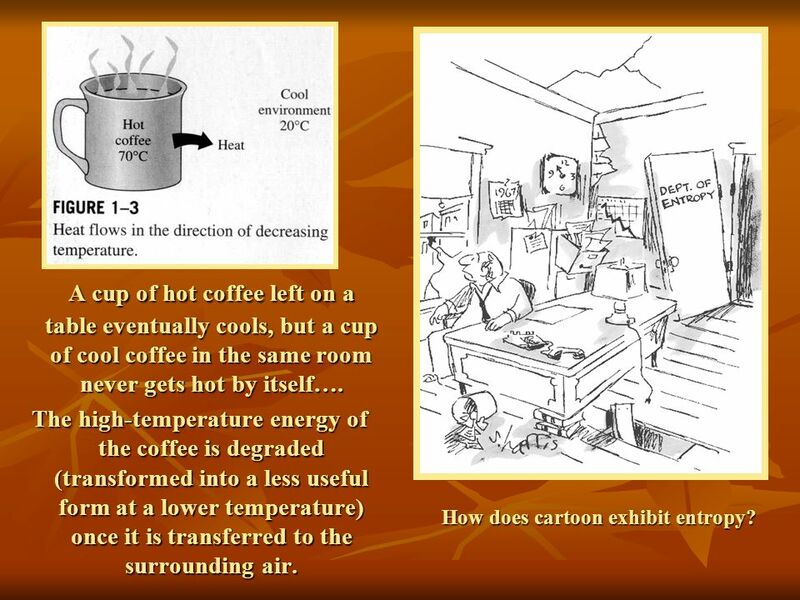 13 A cup of hot coffee left on a table eventually cools, but a cup of cool coffee in the same room never gets hot by itself…. The high-temperature energy of the coffee is degraded (transformed into a less useful form at a lower temperature) once it is transferred to the surrounding air. 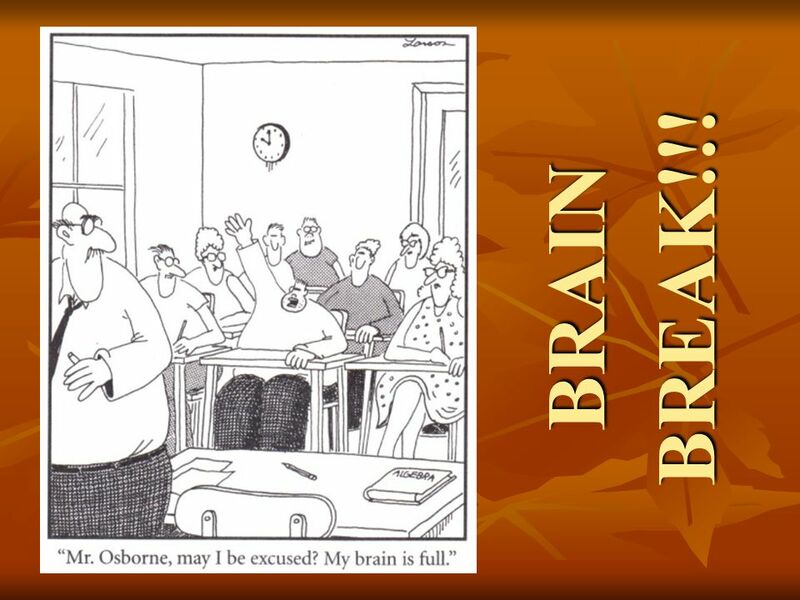 How does cartoon exhibit entropy? 18 Who’s Smarter than Me??? 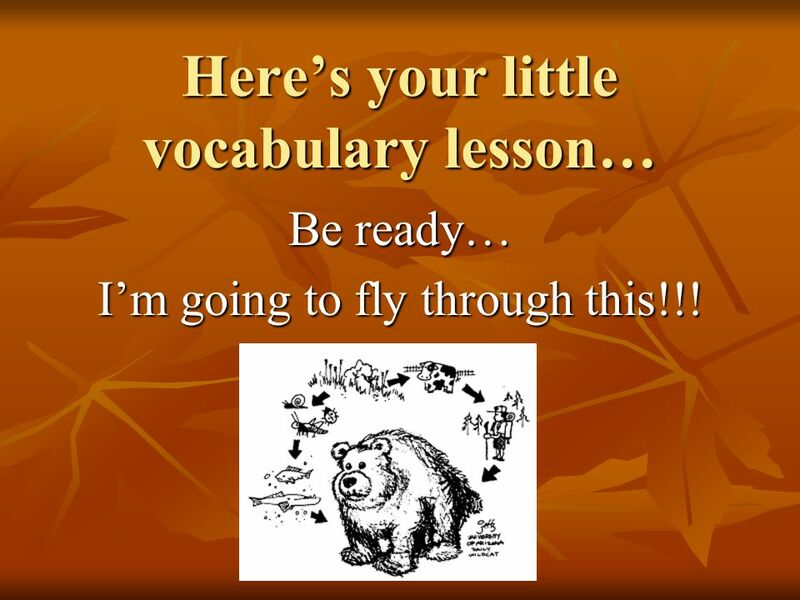 You have received a chart of vocabulary terms. You have 5 minutes to write a short definition of each term that you already know. Leave all others blank! Go! 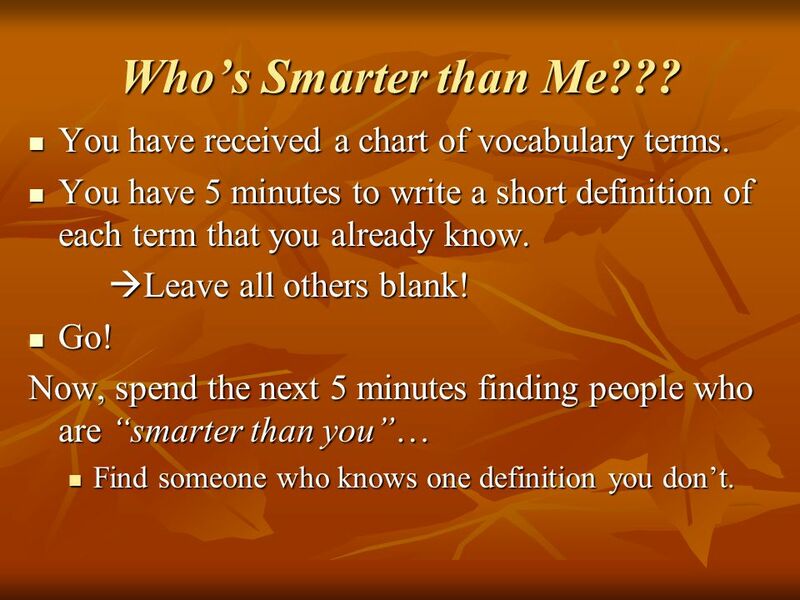 Now, spend the next 5 minutes finding people who are “smarter than you”… Find someone who knows one definition you don’t. Be ready… I’m going to fly through this!!! DETRITUS = organic matter that includes animal carcasses, leaf litter, and feces. 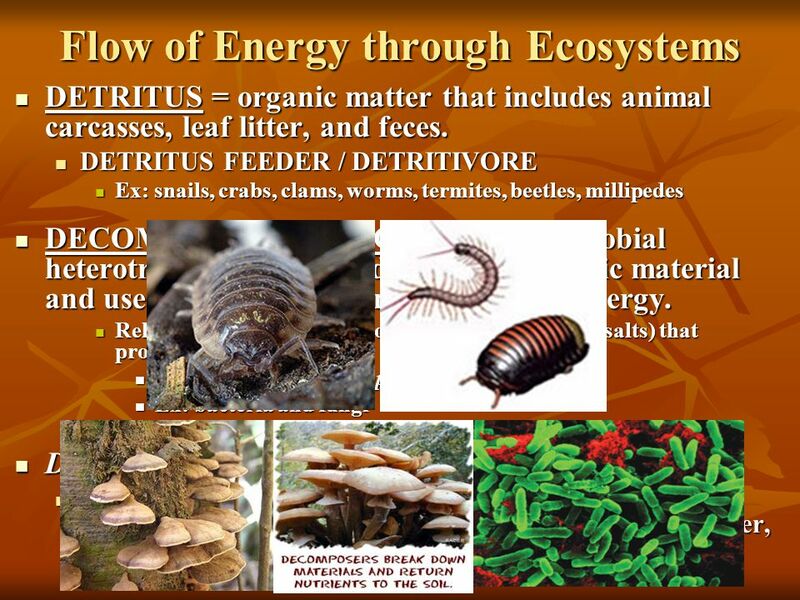 DETRITUS FEEDER / DETRITIVORE Ex: snails, crabs, clams, worms, termites, beetles, millipedes DECOMPOSER / SAPROTROPH = microbial heterotrophs that break down dead organic material and use the decomposition products for energy. 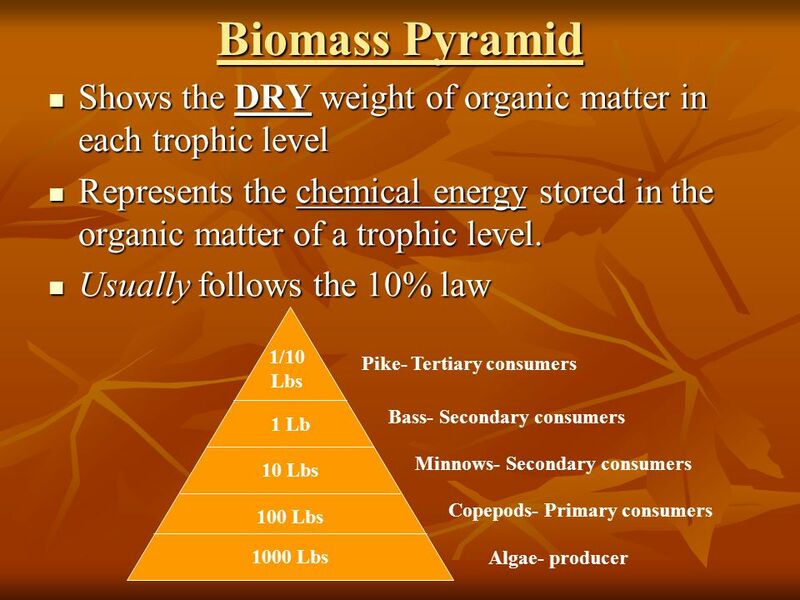 Release simple inorganic molecules (CO2 + mineral salts) that producers reuse. Sapro = “rotten” Troph = “nourishment” Ex: bacteria and fungi Difference between Detritivore and Decomposer: Detritivores actually EAT dead/decaying matter. 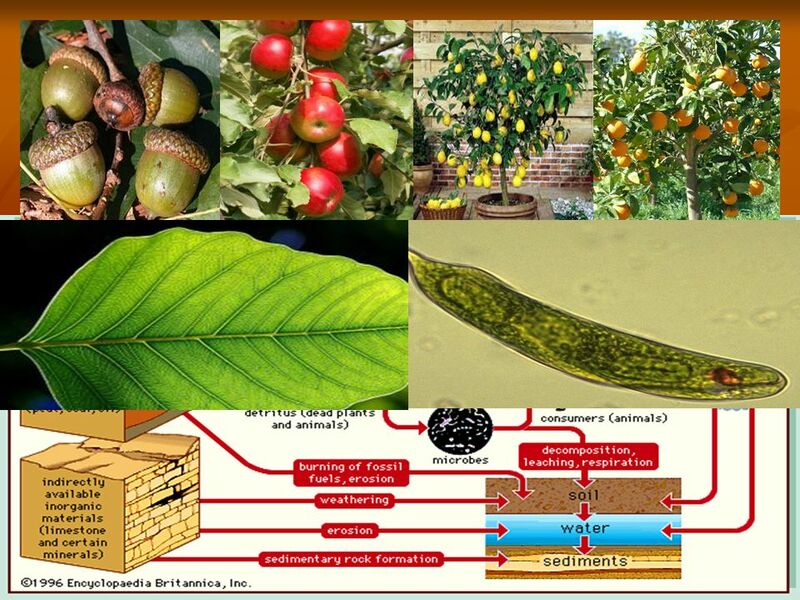 Decomposers secrete enzymes that digest the organic matter, and then absorb the remaining molecules for nutrition. 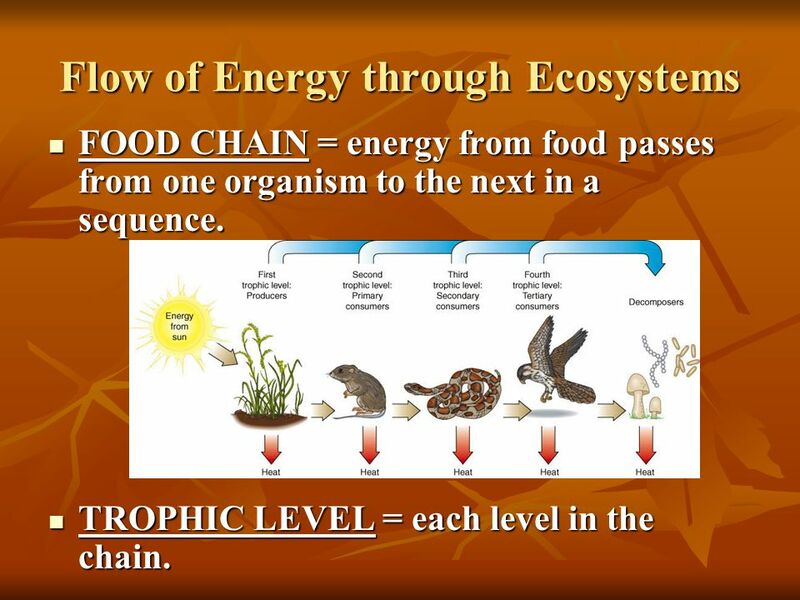 FOOD CHAIN = energy from food passes from one organism to the next in a sequence. 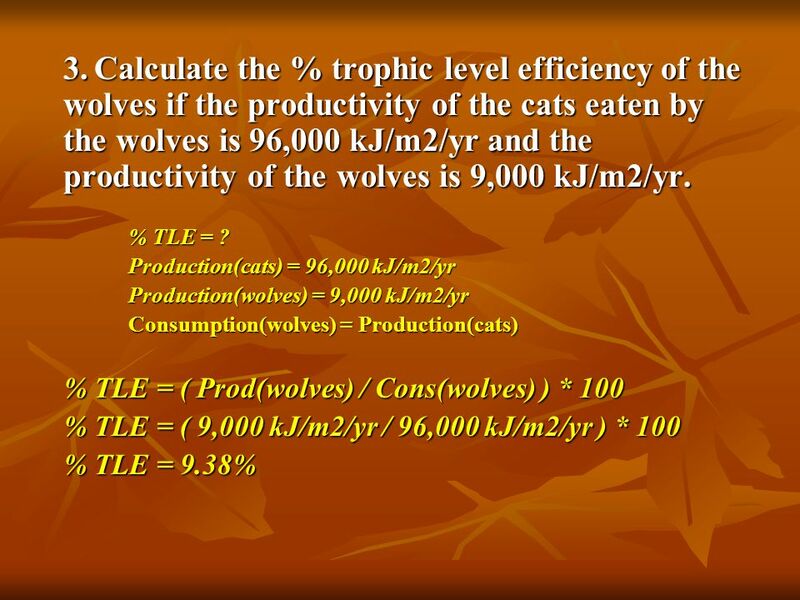 TROPHIC LEVEL = each level in the chain. Simple foodchains are rare in nature! Why?? 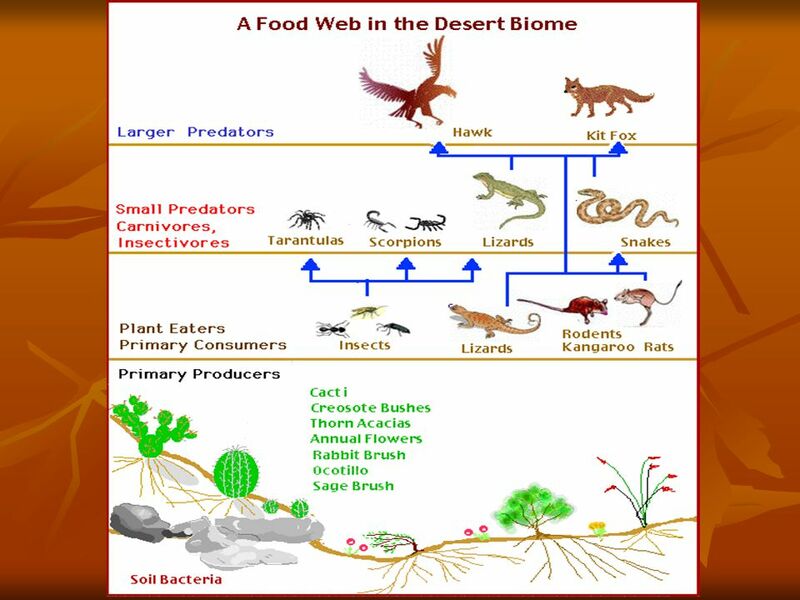 FOOD WEB = complex of interconnected food chains in an ecosystem. Food webs are much more realistic than food chains. 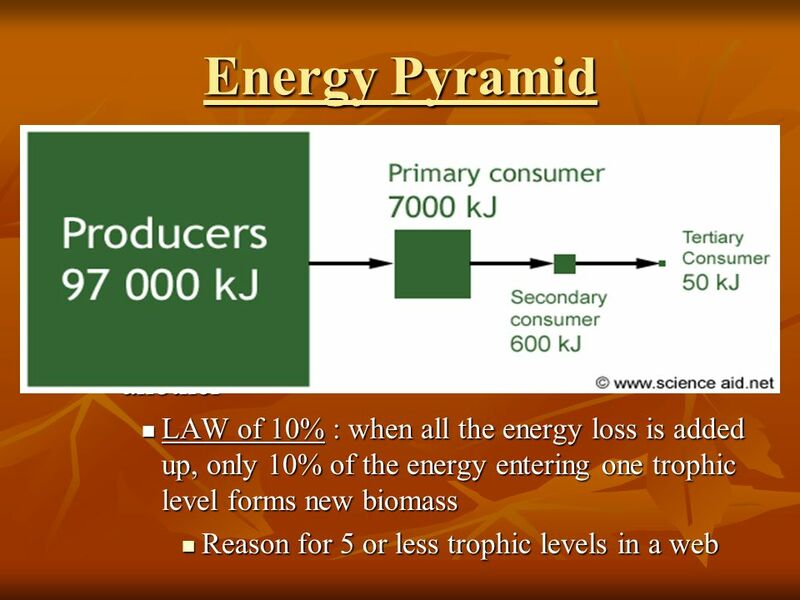 Note: Energy flow is always linear. 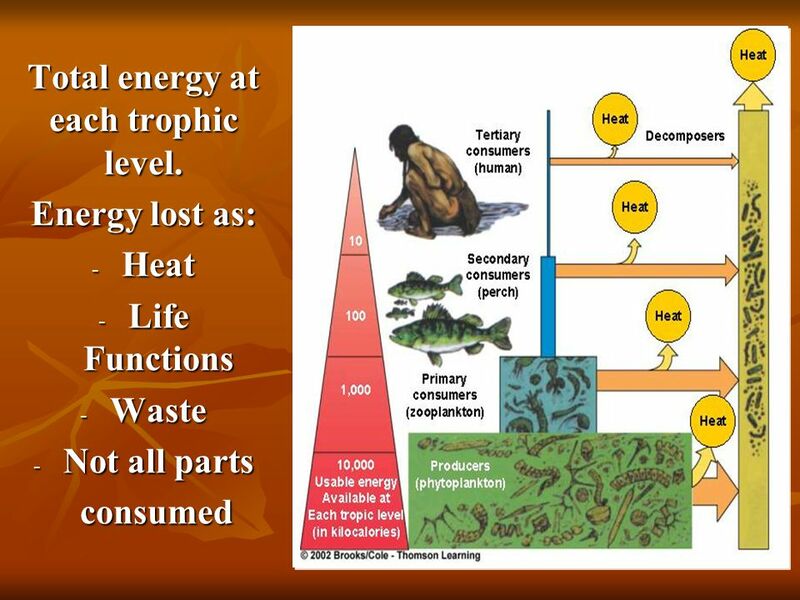 Energy lost as heat is unavailable to other organisms. 27 You should be READING through the CHAPTER!!! Don’t Forget…. 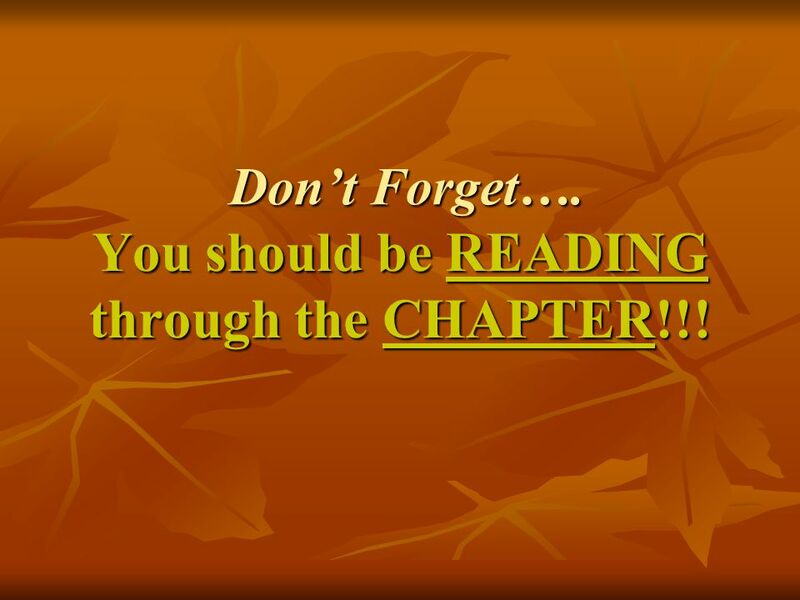 You should be READING through the CHAPTER!!! 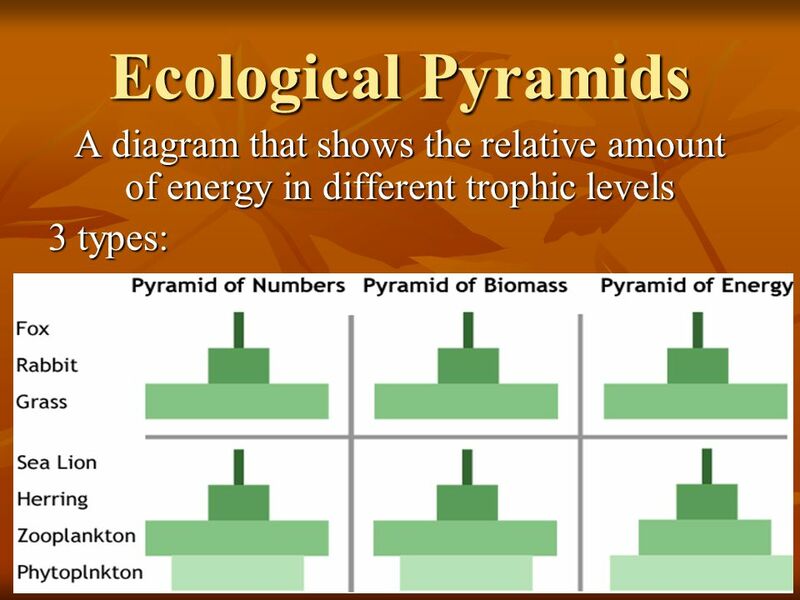 32 Total energy at each trophic level. 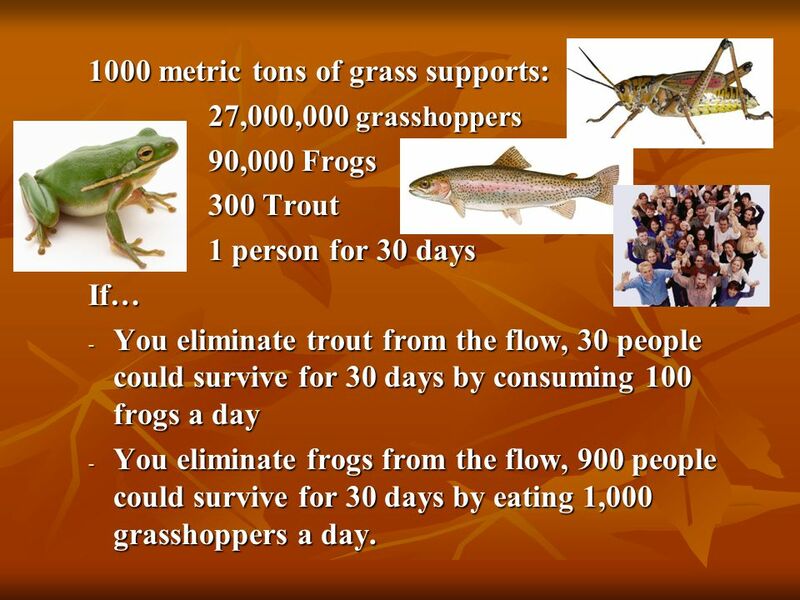 27,000,000 grasshoppers 90,000 Frogs 300 Trout 1 person for 30 days If… You eliminate trout from the flow, 30 people could survive for 30 days by consuming 100 frogs a day You eliminate frogs from the flow, 900 people could survive for 30 days by eating 1,000 grasshoppers a day. 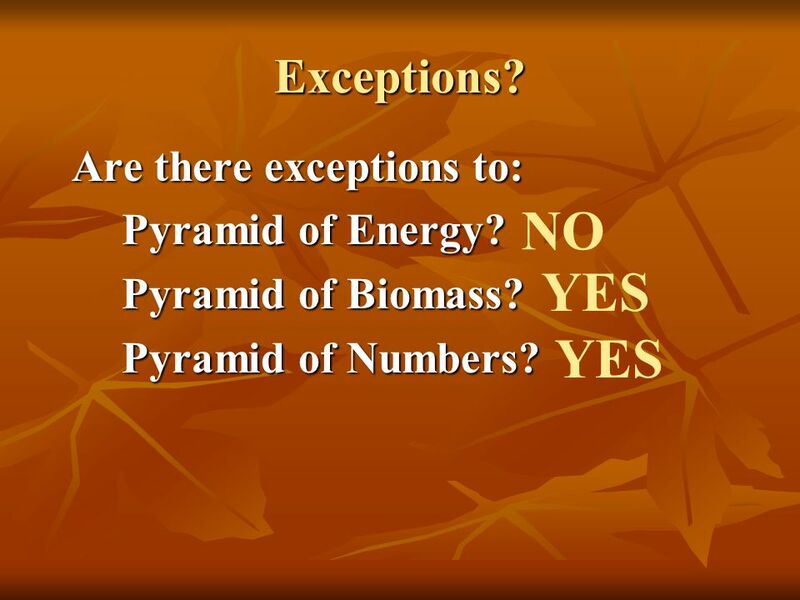 38 NO YES YES Exceptions? 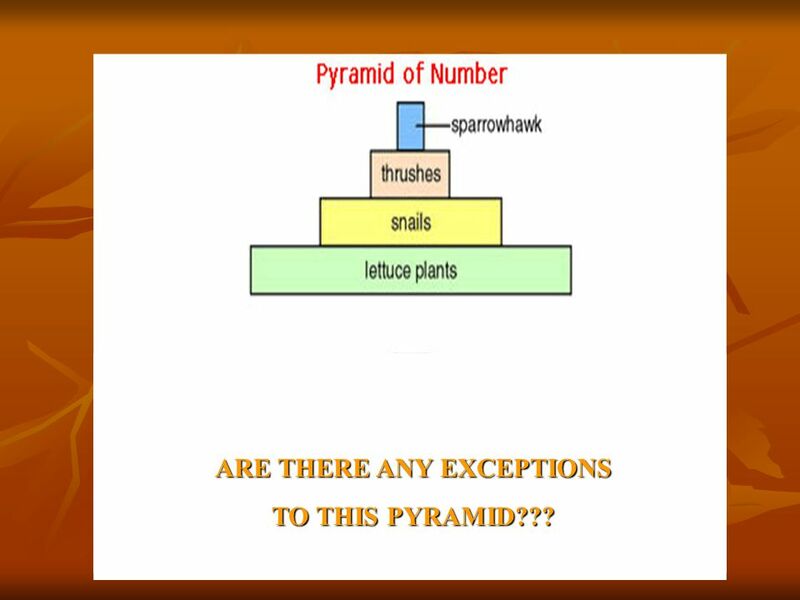 Are there exceptions to: Pyramid of Energy? 42 GPP & NPP Only the energy represented by NPP is available for consumers, and remember: they only use a portion of it! 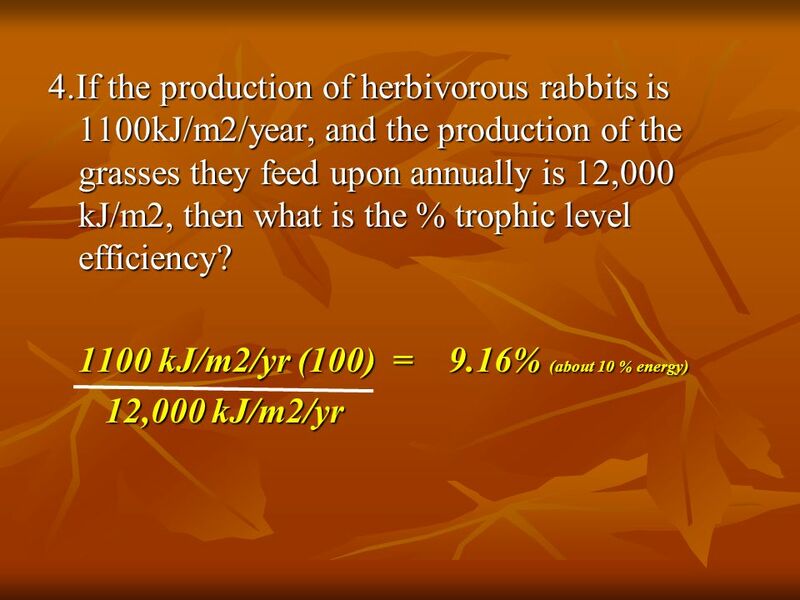 The Earth’s total NPP is the upper limit determining the planet’s carrying capacity for all species. 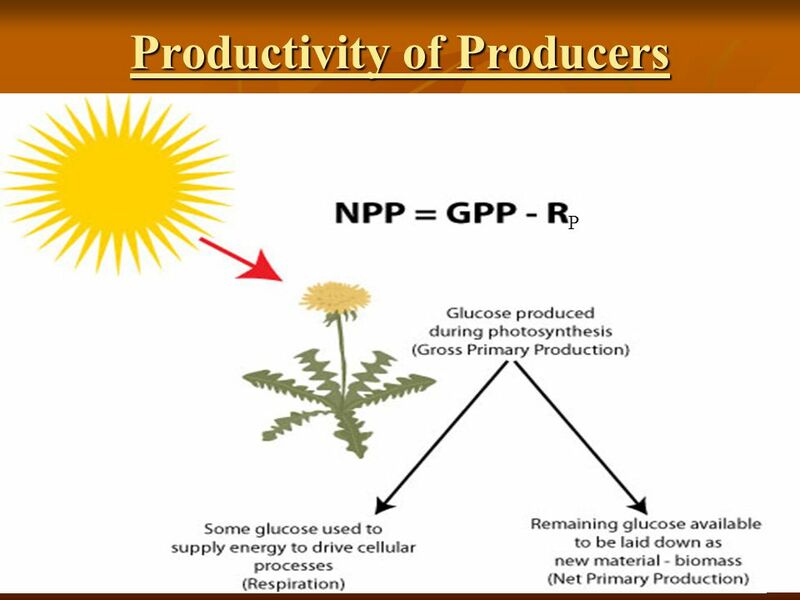 GPP & NPP are expressed as: Energy per unit area per unit time (kcal/m2/yr) Dry weight (g carbon/m2/yr) IMPORTANT! Tropical Rainforests Most nutrients are in the vegetation, not in the soil. The land will therefore lose nutrients quickly when they’re cleared for growing crops. Then, it’s $$$$$$ to add lots of fertilizers! 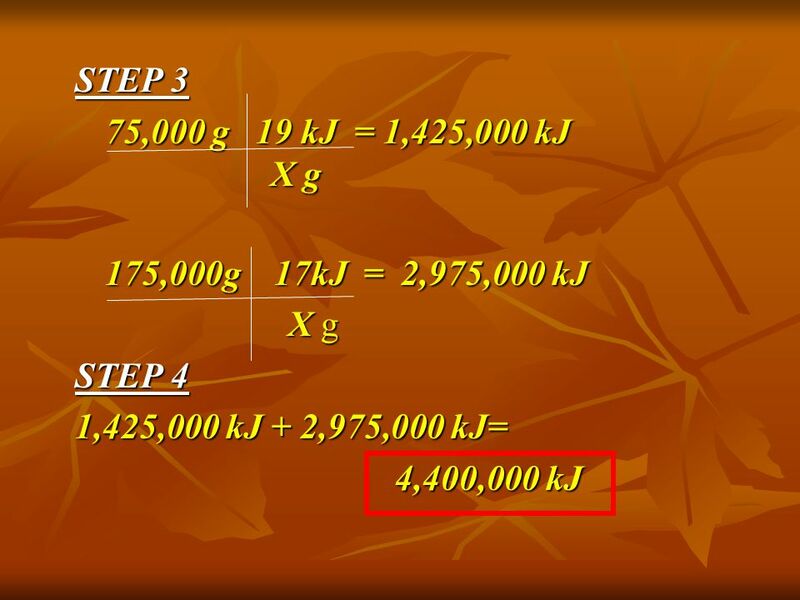 Agricultural Land Highly modified and managed Goal: increase the NPP and biomass by adding water and nutrients like nitrates and phosphates. Does it work?? Humans use, waste, or destroy ~27% of Earth’s total potential NPP, and 40% of Earth’s land NPP. 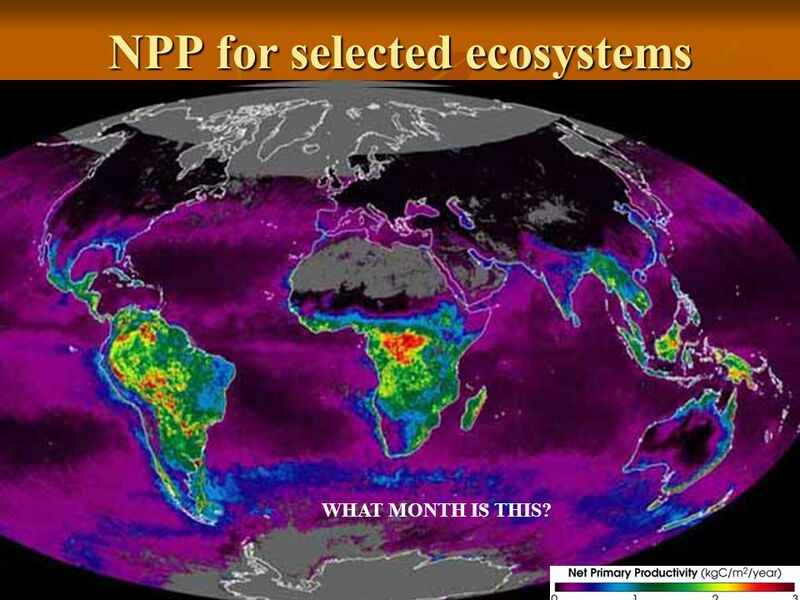 Not all ecosystems have the same NPP. Some are much more productive than others! WHAT MONTH IS THIS? WHAT MONTH IS THIS? 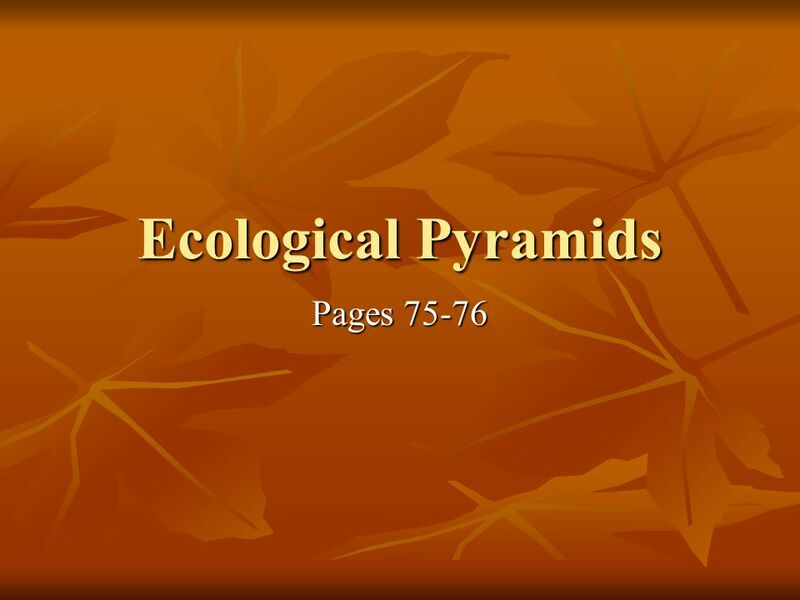 First, read the paragraphs and understand the pyramid and food web at the bottom of the page. Then, spend 10 minutes working on the calculations BY YOURSELF. 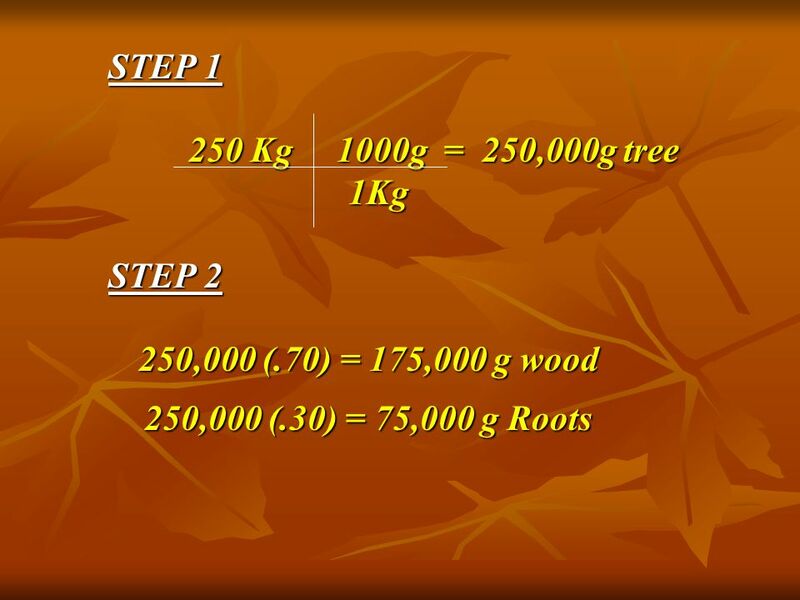 The formulas are included to help you. Plug and Chug! 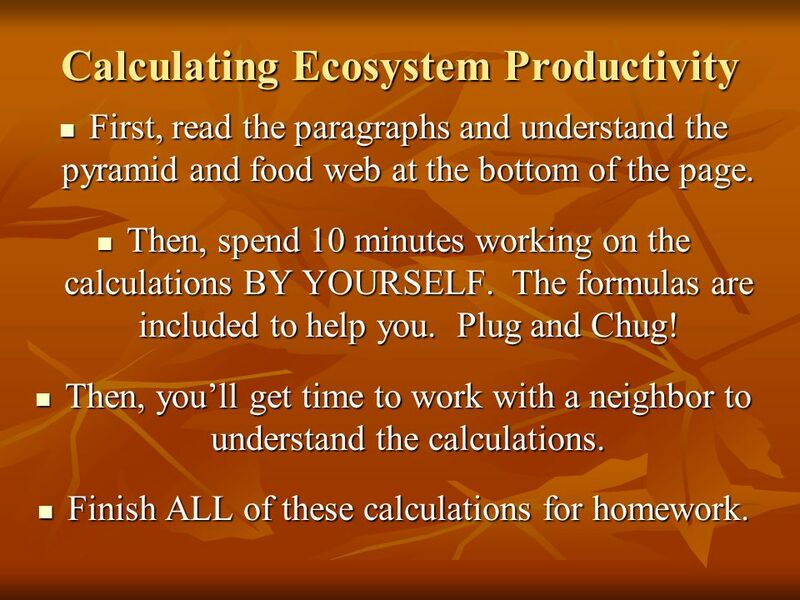 Then, you’ll get time to work with a neighbor to understand the calculations. Finish ALL of these calculations for homework. 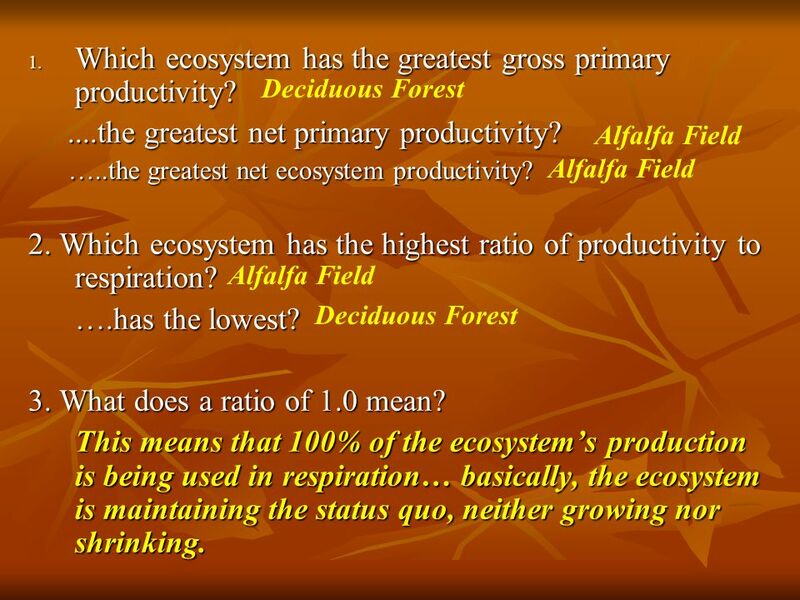 49 Which ecosystem has the greatest gross primary productivity? 50 4. What source(s) of respiration has been omitted from the table? 3. 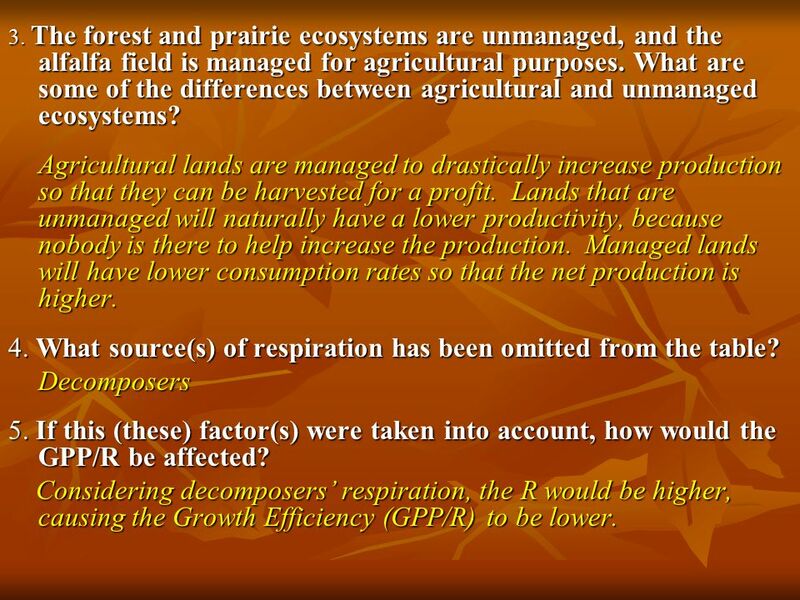 The forest and prairie ecosystems are unmanaged, and the alfalfa field is managed for agricultural purposes. 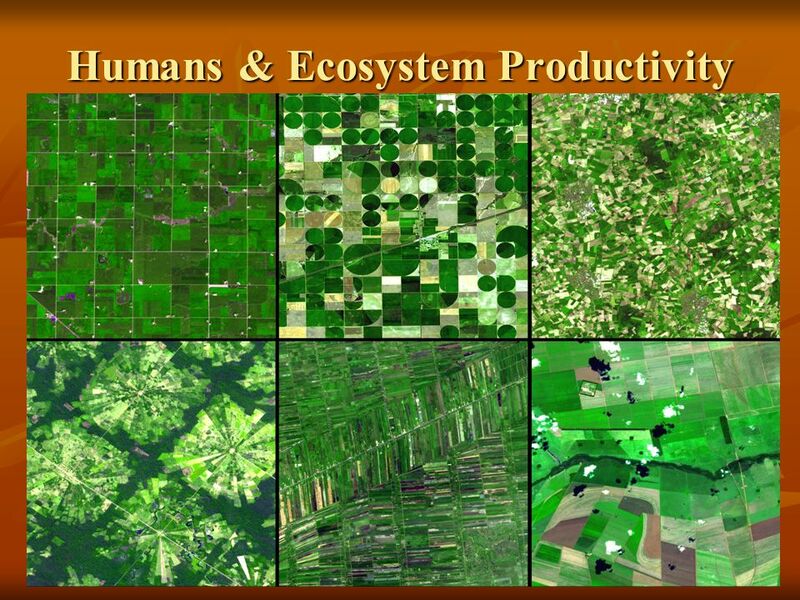 What are some of the differences between agricultural and unmanaged ecosystems? Agricultural lands are managed to drastically increase production so that they can be harvested for a profit. 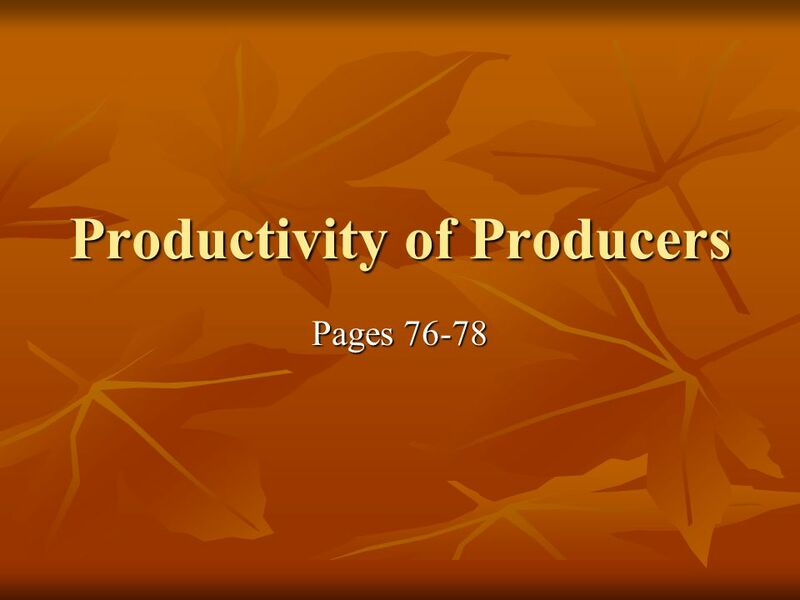 Lands that are unmanaged will naturally have a lower productivity, because nobody is there to help increase the production. 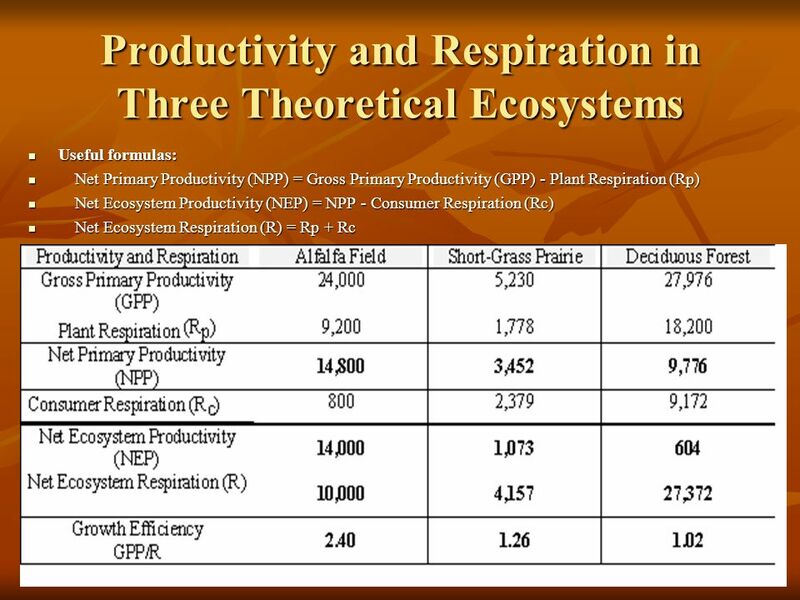 Managed lands will have lower consumption rates so that the net production is higher. 4. 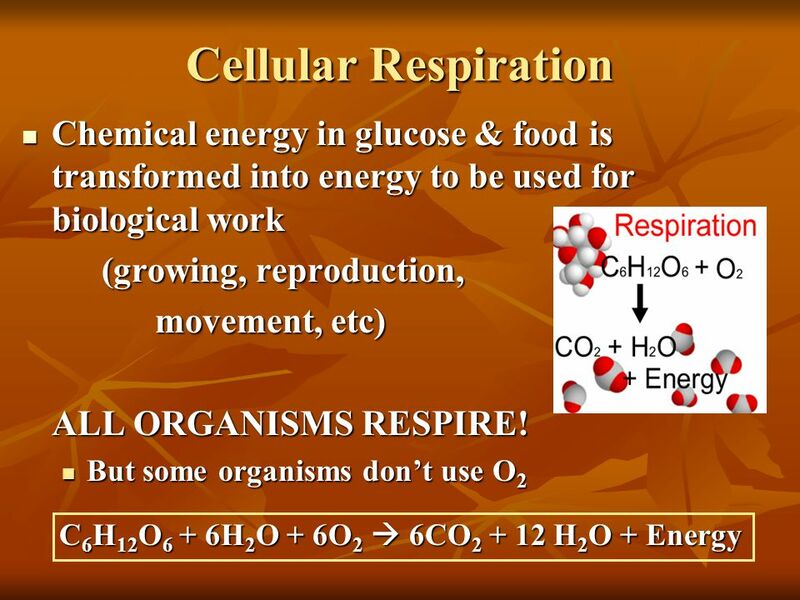 What source(s) of respiration has been omitted from the table? Decomposers 5. 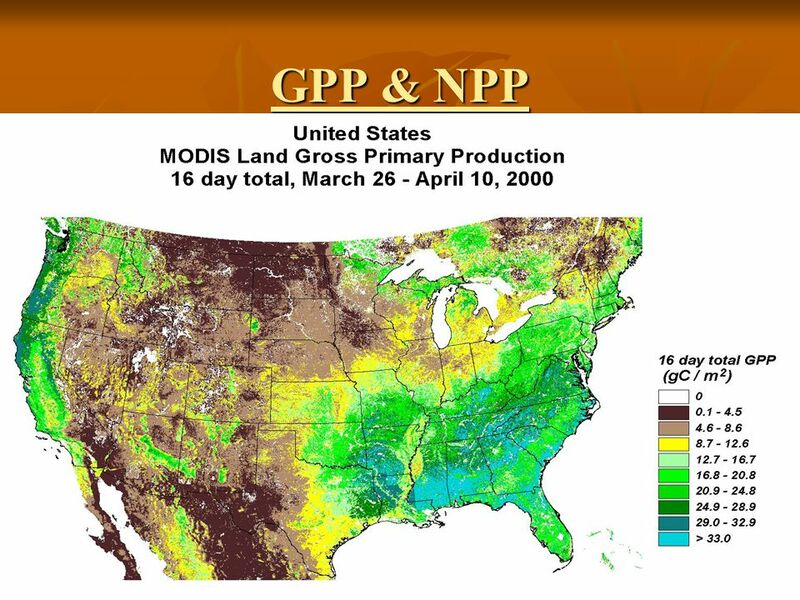 If this (these) factor(s) were taken into account, how would the GPP/R be affected? 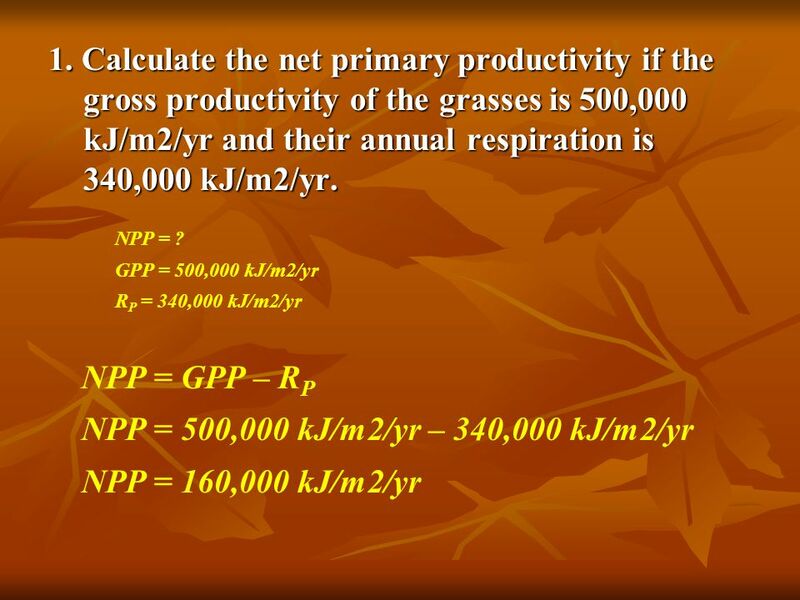 Considering decomposers’ respiration, the R would be higher, causing the Growth Efficiency (GPP/R) to be lower. 53 3. 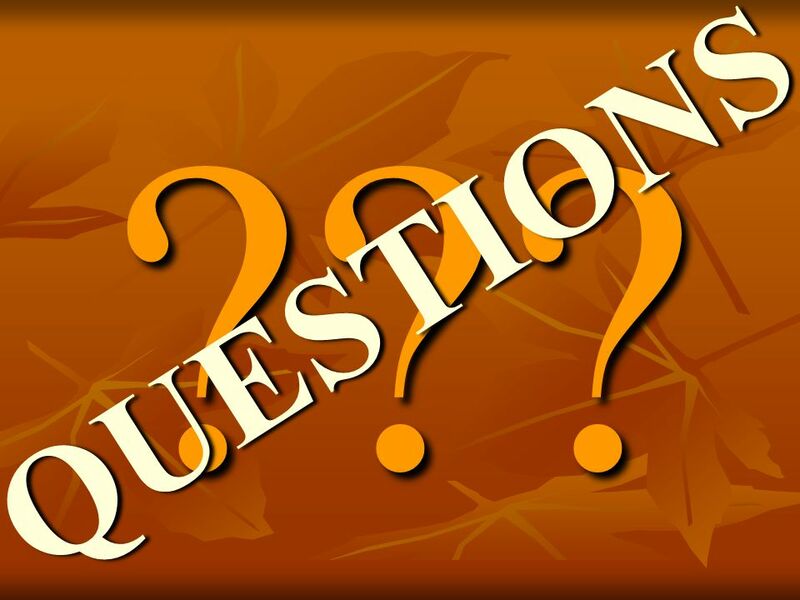 What does your answer to the previous question say about the ecosystem? What’s happening to it? NPP is GPP – RP. 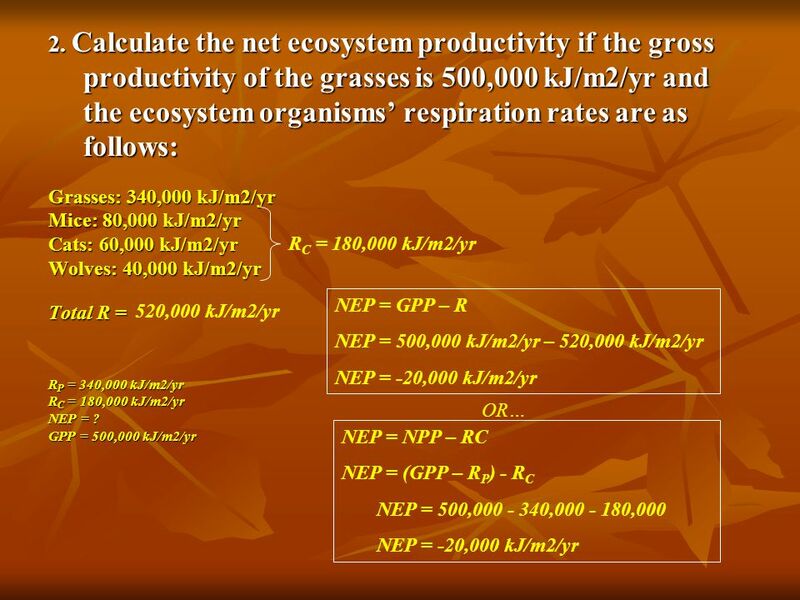 So, since the NEP is negative, the ecosystem is using more than it is producing. 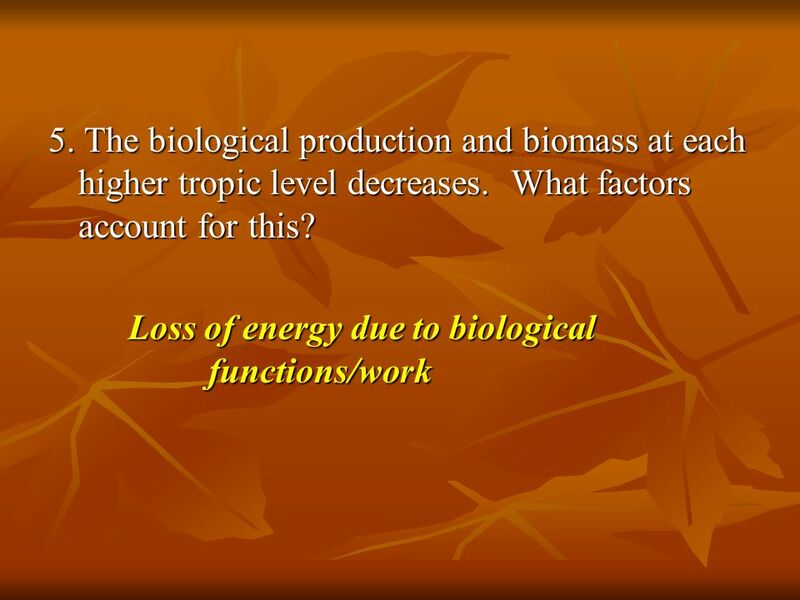 An ecosystem in such a state is losing biomass. 54 2. 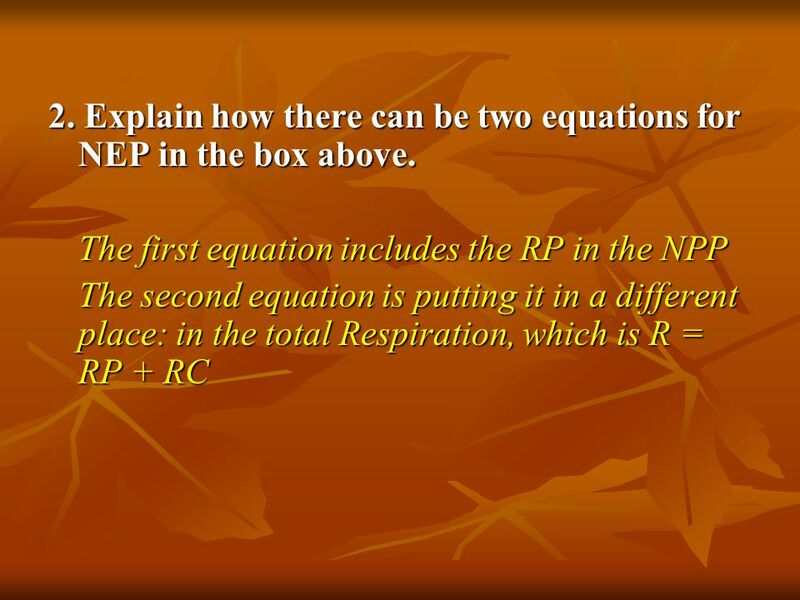 Explain how there can be two equations for NEP in the box above. 60 Any activity where energy is transformed from one form to another. 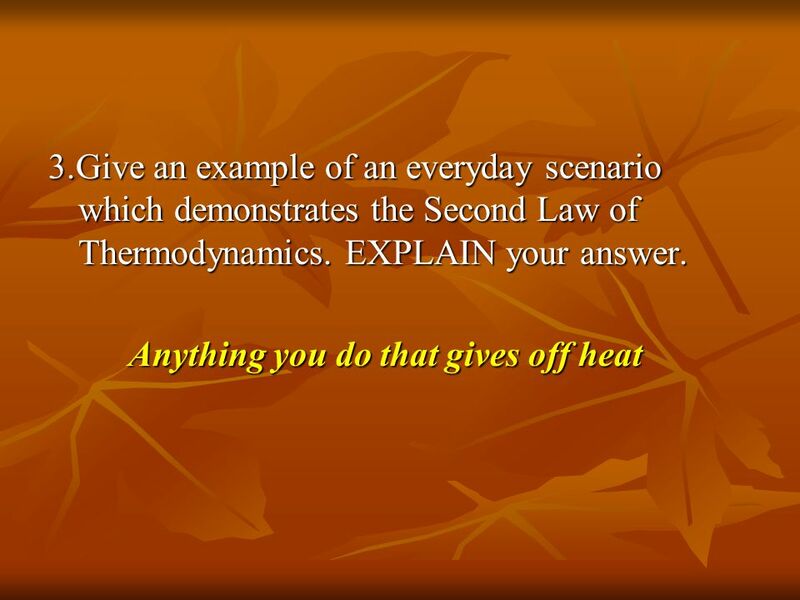 2.Give an example of an everyday scenario which demonstrates the First Law of Thermodynamics. EXPLAIN your answer. 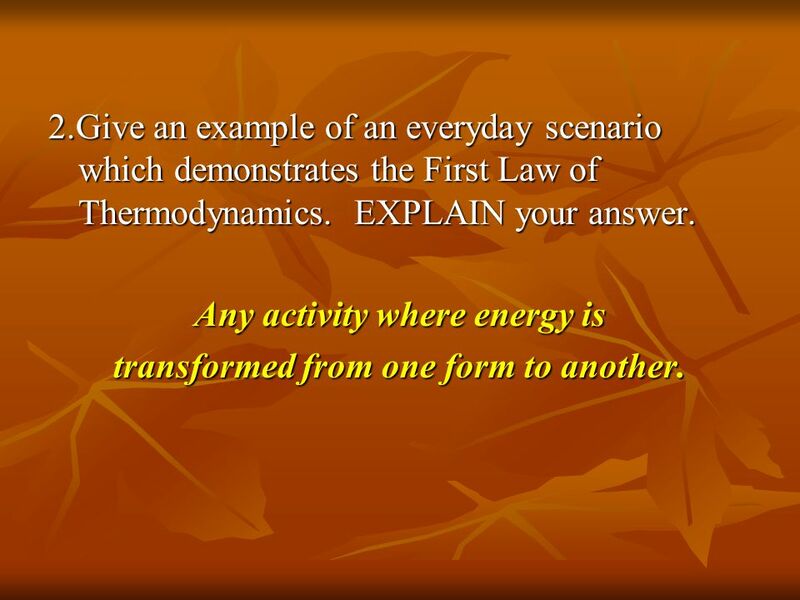 Any activity where energy is transformed from one form to another. 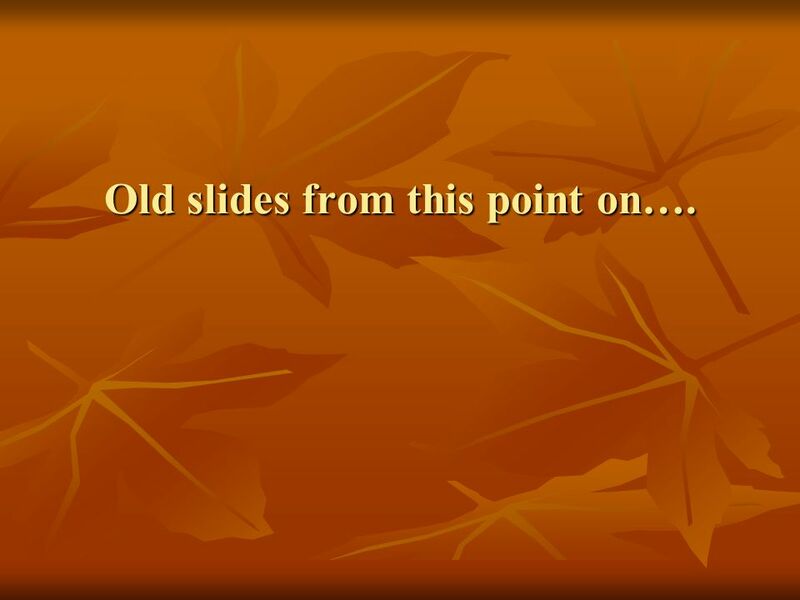 64 Old slides from this point on…. 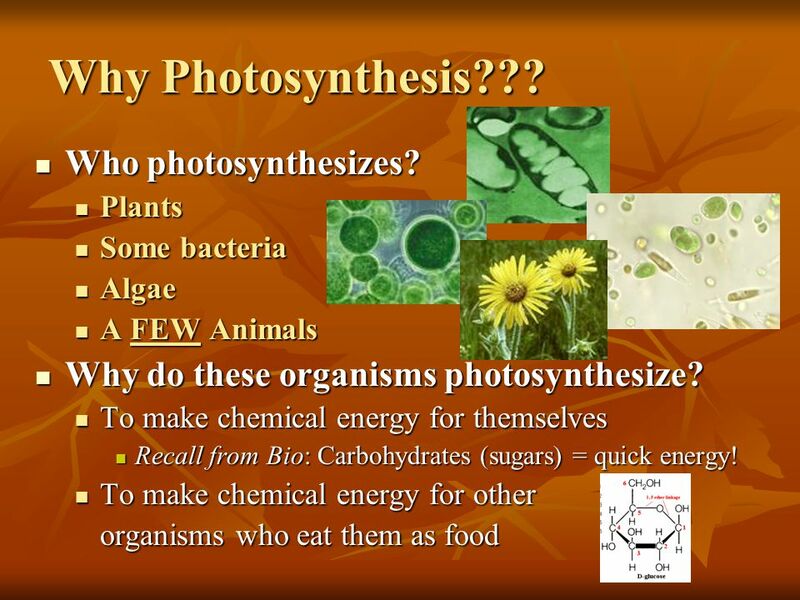 66 Why Photosynthesis??? 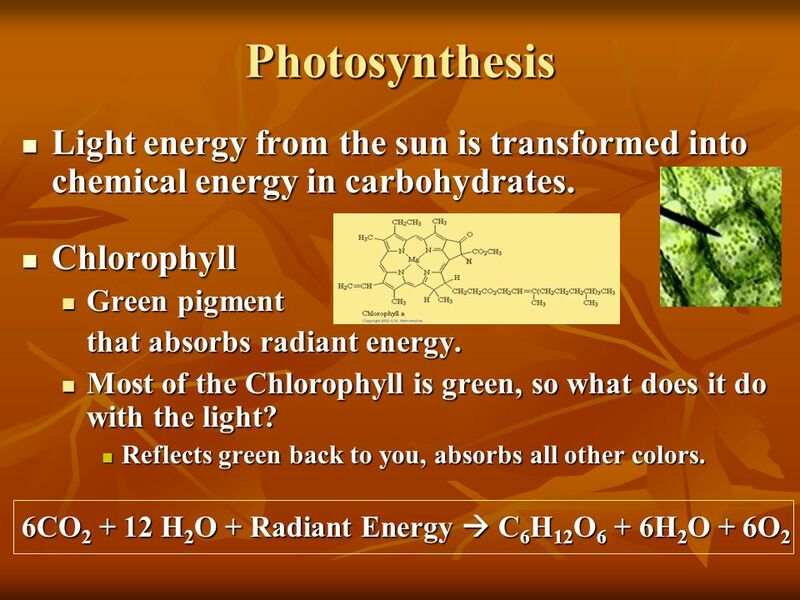 Who photosynthesizes? 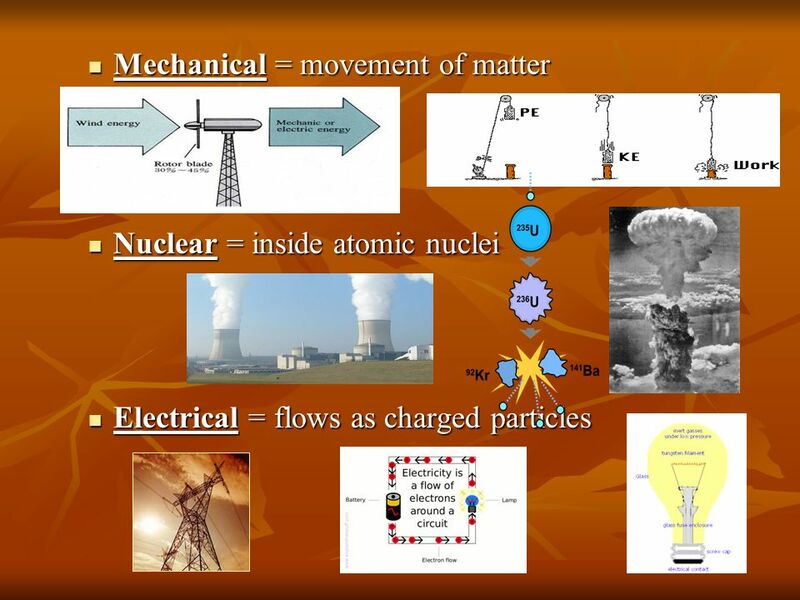 Download ppt "Chapter 4 Ecosystems & Energy." 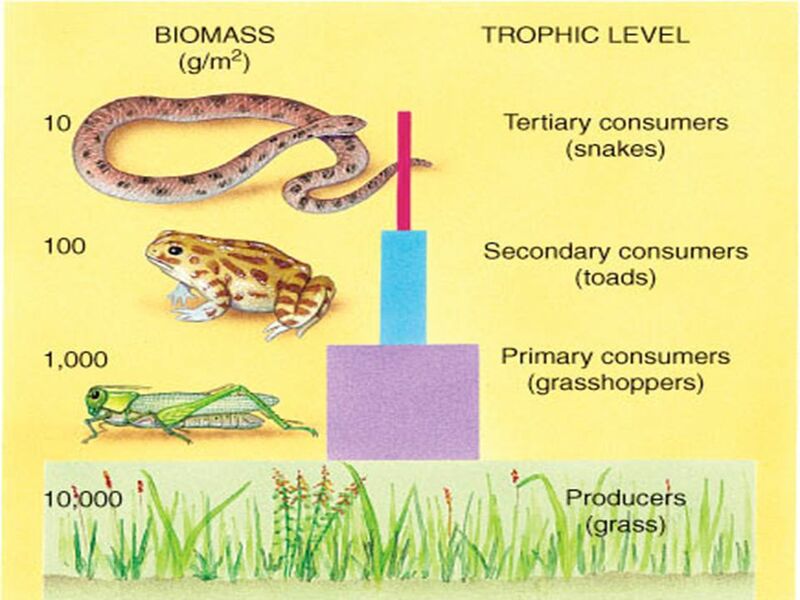 UNIT ONE: General Ecology and Population Part 1: Content Food Chains, Food Webs Energy Flow and Trophic Levels. Time: 5 days. 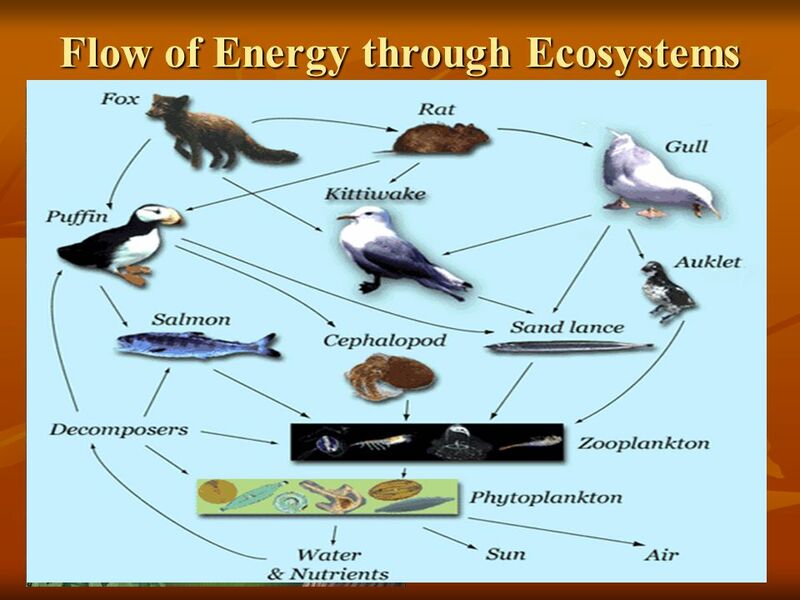 Chapter 3 Ecosystems and Energy. 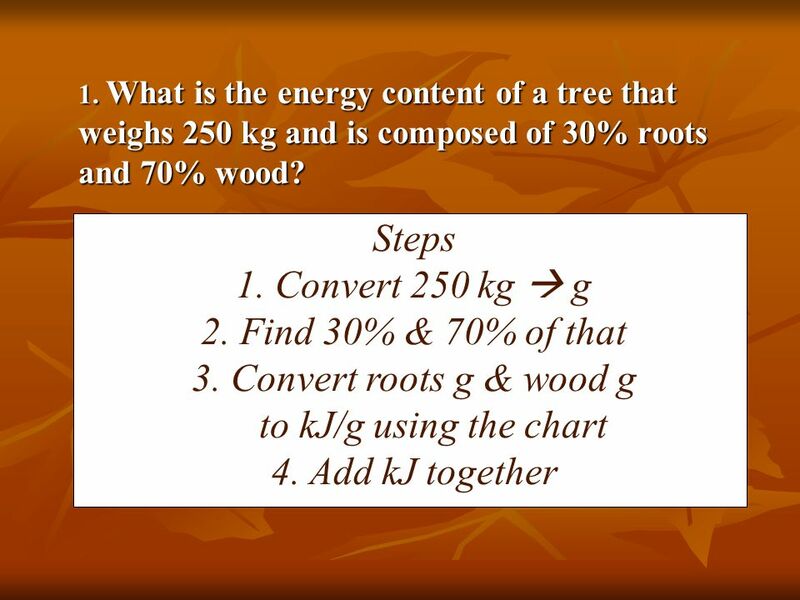 Ecosystems and Energy 3. © 2012 John Wiley & Sons, Inc. All rights reserved. 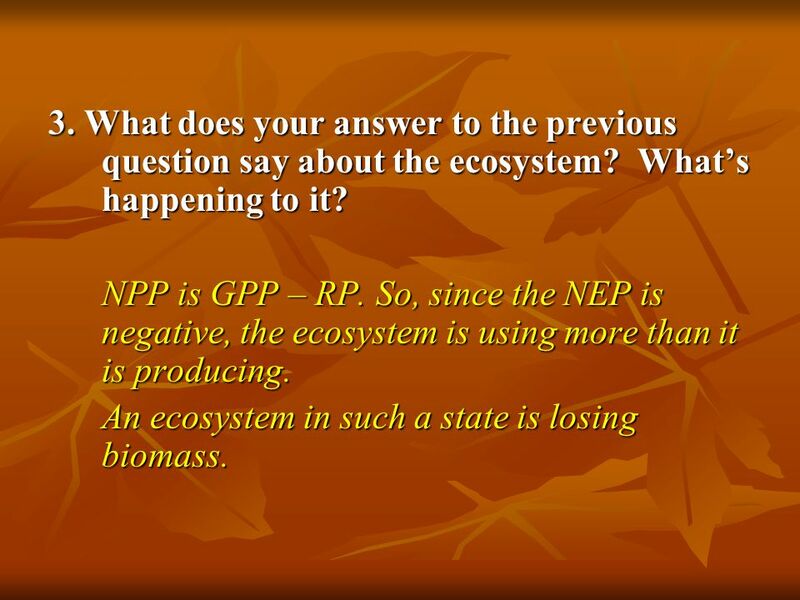 Overview of Chapter 3  What is Ecology? 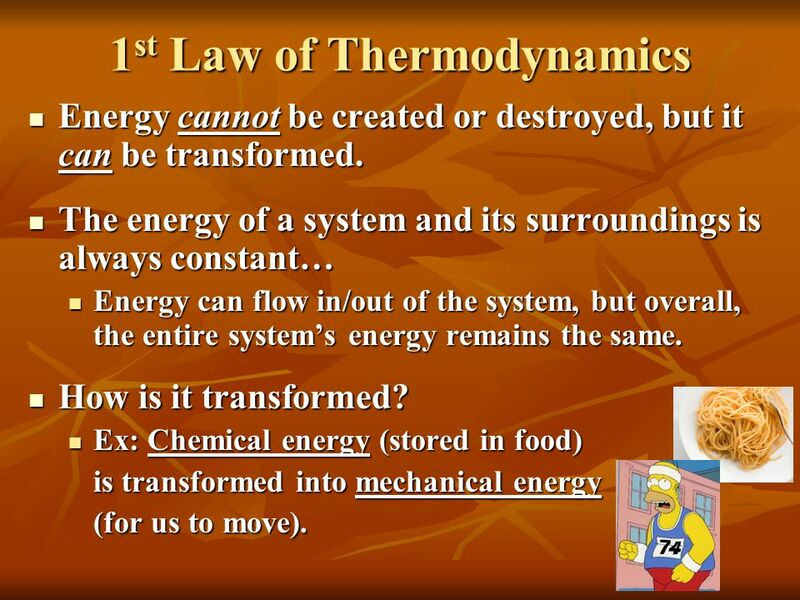  The Energy of Life  Laws of Thermodynamics. 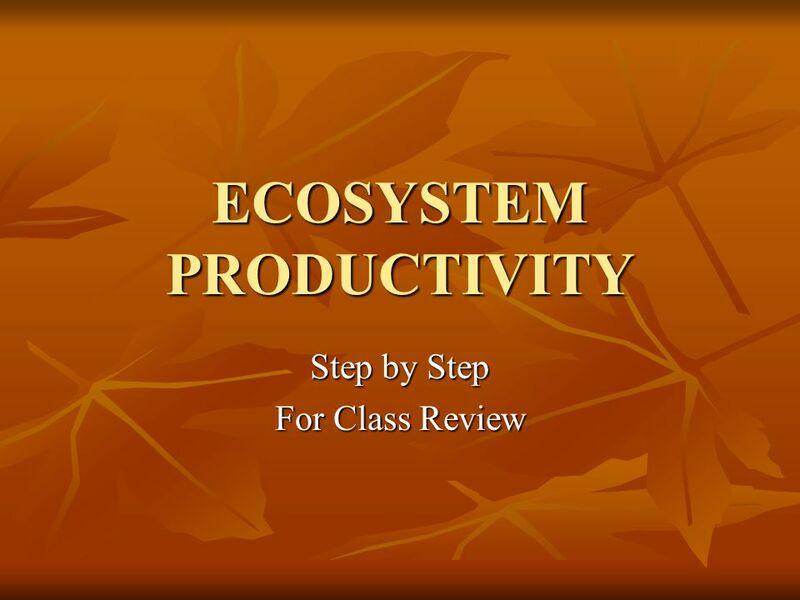 Chapter 3 Ecosystems and Energy. 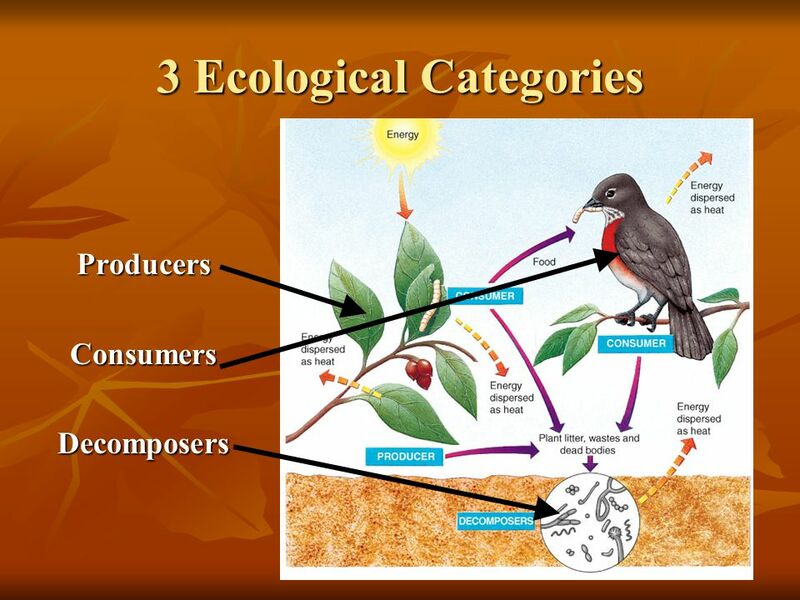 Overview of Chapter 3  What is Ecology? 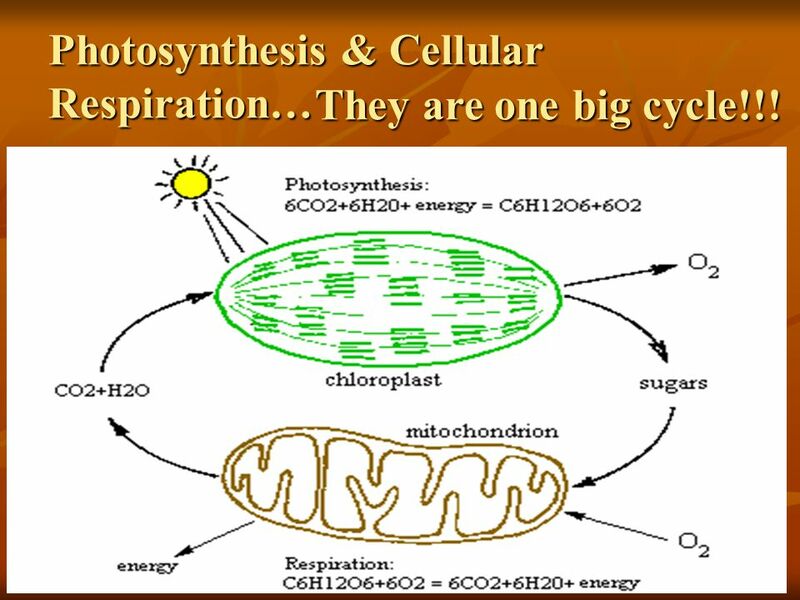  The Energy of Life  Laws of Thermodynamics  Photosynthesis and Cellular. 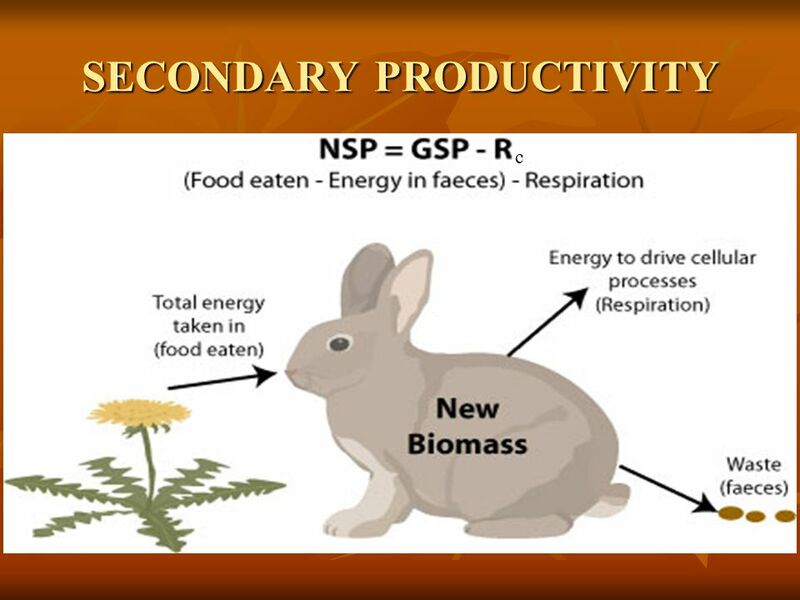 Chapter 3 Ecosystems and Energy. 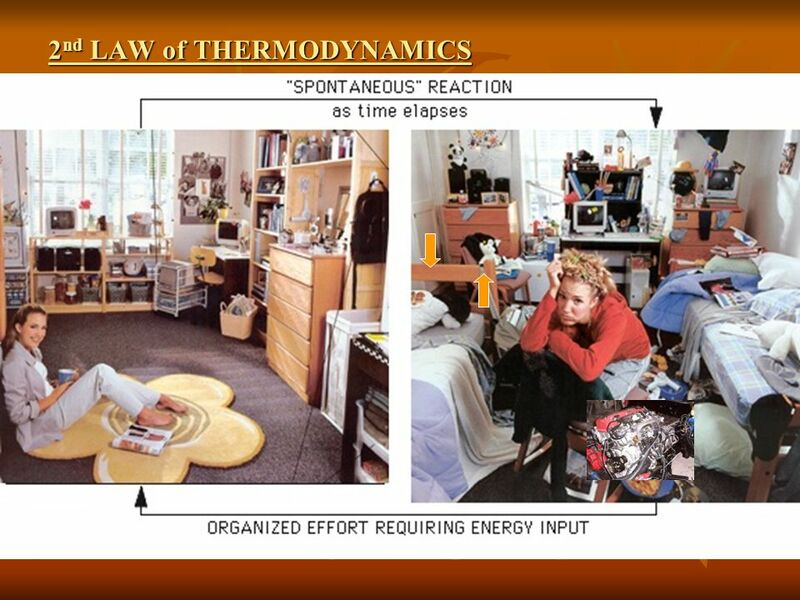 Overview of Chapter 3 o Ecology o Energy First Law of Thermodynamics First Law of Thermodynamics Second Law of Thermodynamics. 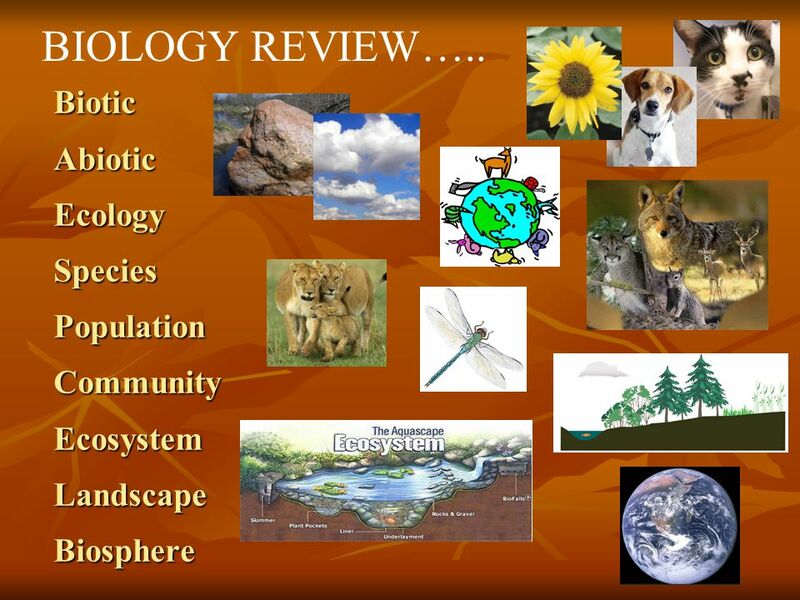 Ecology Ecology- Science of the interactions between organisms and their environment. 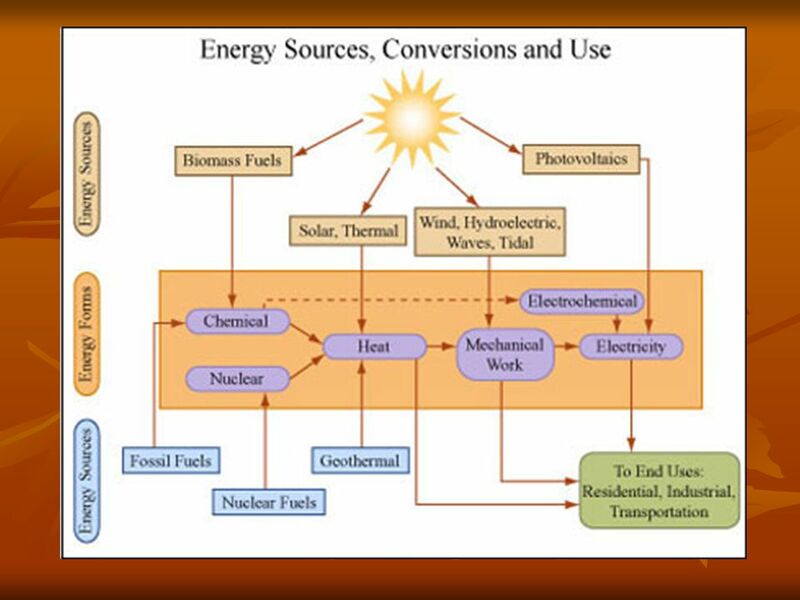 Ecosystems and Energy Chapter 3. 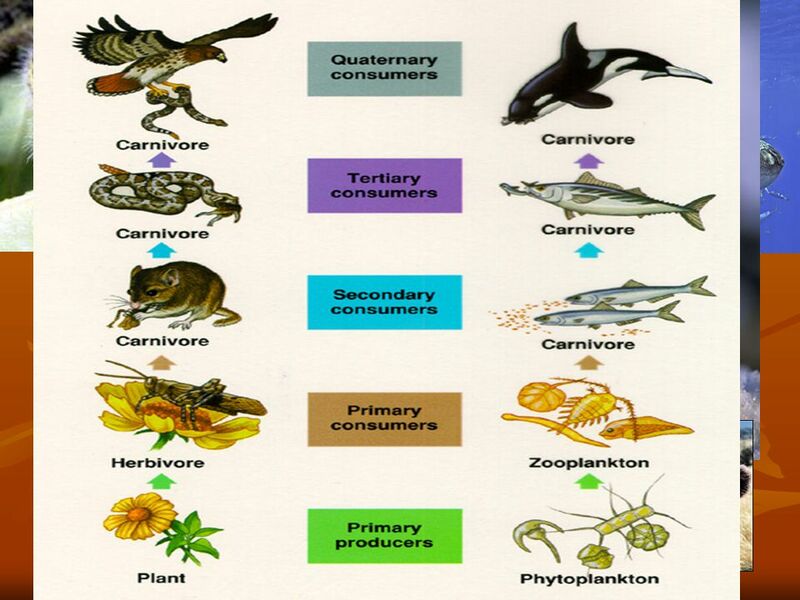 Ecology Study of the interactions of organisms and their living and non-living environment Many different scales to ecology. Discussion: What is it? How Does it Transfer? 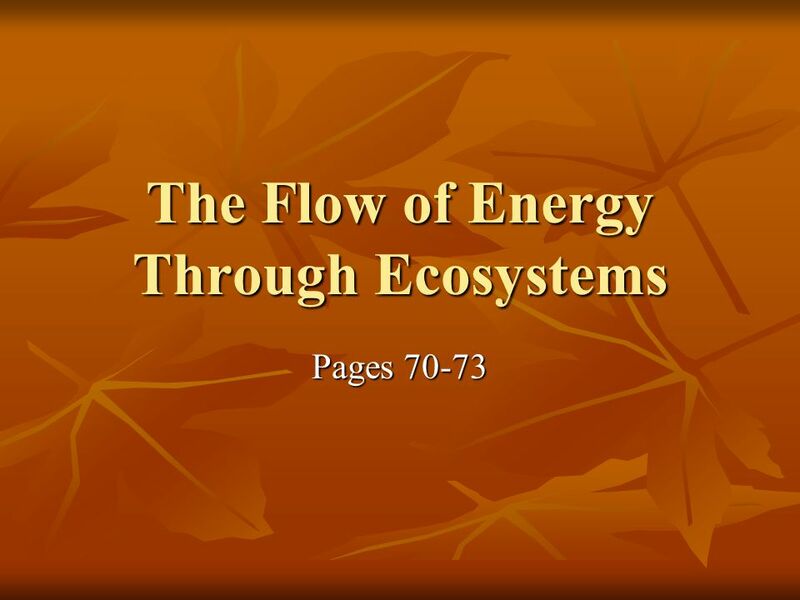 Energy Flow How does energy move through the ecosystem? 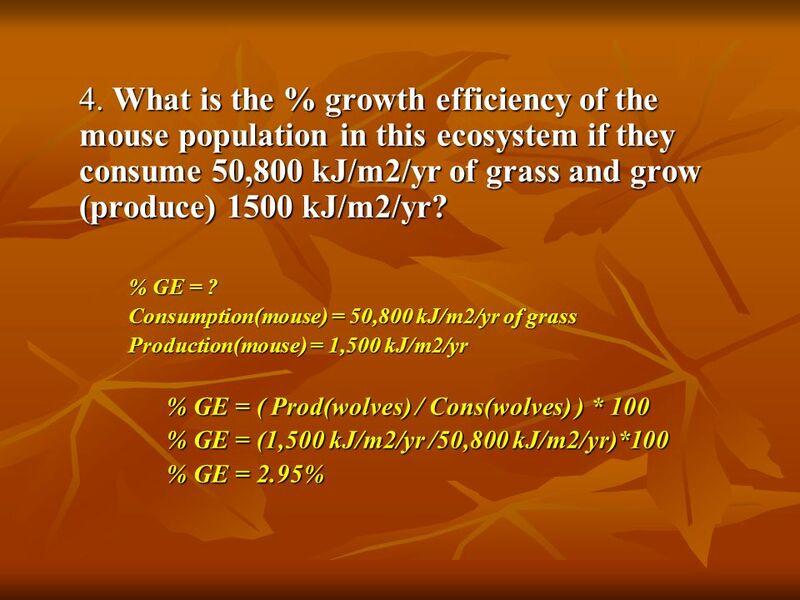 DO NOW Answer the following: What is Ecology?. 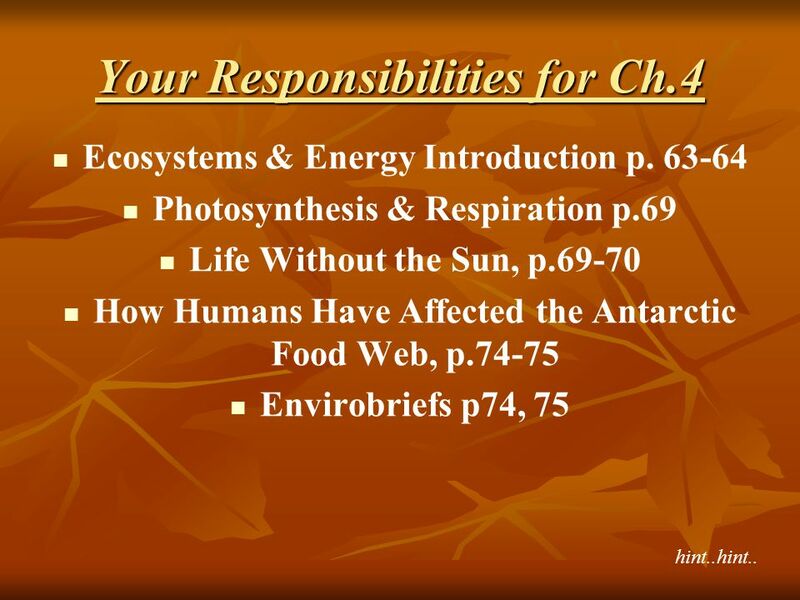 Principles of Ecology Chapter 2. Student Performance Standards SB4. 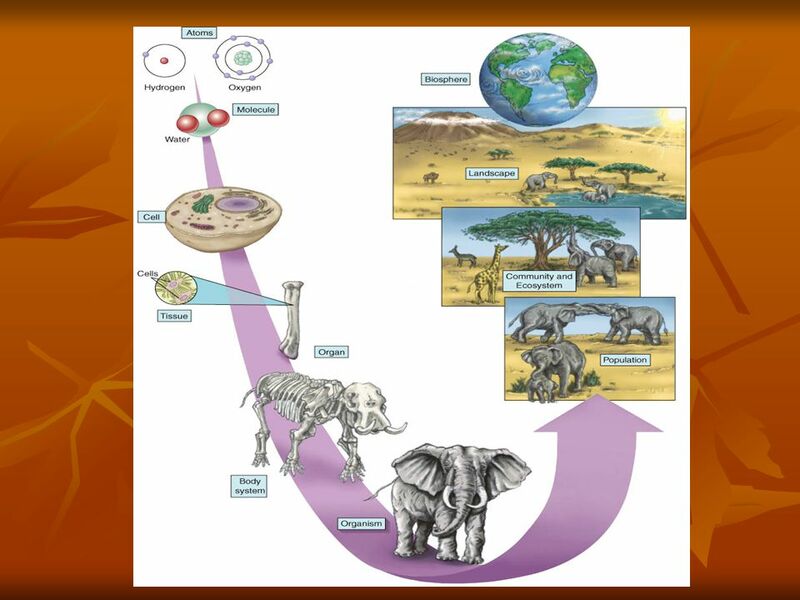 Students will assess the dependence of all organisms on one another and the flow of.